While combing the grocery store aisles for healthy selections, I notice more and more shoppers are deliberately reading labels before making their food purchases. Remember when polyester clothing was popular? Polyester is a synthetic polymer made of purified terephthalic acid (PTA) or dimethyl ester dimethyl terephthalate (DMT) and monoethylene glycol (MEG). It is actually a form of plastic, and DuPont Corporation bought the rights to manufacture it in the U.S. in the 1950s. It spurred on generations of families who began to read clothing labels more conscientiously because they wanted more natural fabrics. 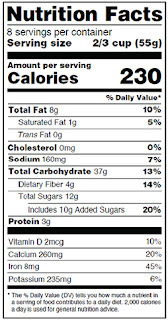 Below is the look of the "new food label" that larger manufacturers will start using in July 2018. 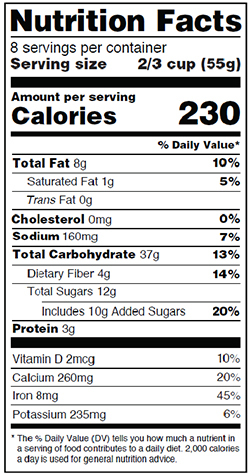 The new label reflects updated information from nutrition science-based evidence. It's interesting to see the changes based on where American diets are lacking ~ vitamin D and potassium are now required, and vitamin C and vitamin A have been removed (as we seem to be doing well enough in our intake of these nutrients). messages brought to you by Project Healthy Schools.